Includes CD recording of selected rare guitars from the book. The first 500 copies are hand-signed and numbered by Wyeth & Glise. “I Speak” also comes with a complimentary signed & numbered COE (“Certificate of Authenticity”) and Provenance for collectors. Click here for full bios of Wyeth and Glise. 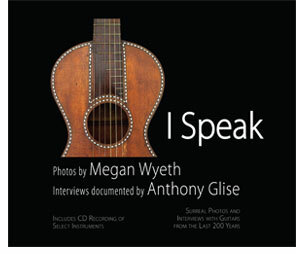 1) CD “I Speak” (identical to the CD in the book but in a CD case with additional program notes about the music). These unframed limited edition, hand-signed prints come in various sizes, printed on high-grade gallery paper, and are identical to the gallery prints being shown throughout the US and Europe for the “I Speak” gallery tour.